For years I didn’t make beans, except for split peas, chick peas and lentils, from scratch. The reason was that it took so long to cook them even when they were presoaked, and they never came out as nicely as the canned beans. It just wasn’t worth it and didn’t make any sense to me, especially with the cost of electricity so high, who wants to have their stove on for five or six hours or maybe longer, just to soften the beans? The canned bean people, well that’s their specialty; that’s what they do, so why not let them do it? I feel the same way about baking my own bread. I tried it many times, but my breads were always yeasty tasting, no matter what kind of bread I was making. And often times the bread wouldn’t rise as much as the recipe indicated it should. I tried powdered yeast and cake yeast, same thing. Maybe the water wasn’t hot enough, maybe too hot, I don’t know, but at some point I figured that bakers spend their lives perfecting their art of bread-making, so why not let them do it? It made my life a whole lot easier. Anyway, one day Steve brought home a huge bag of beans, not knowing the process I had already gone through years ago, which led me to stay on the canned bean path. Now I had the beans, so how was I going to cook them? I recalled seeing someone on T.V. making the perfect home fries. They added (I think) baking soda to the water to cook the potatoes, so that it would eat away a little at the edges/surfaces of the potato cubes, which in turn made for crispier edges when baked. Even though dried beans are a whole lot harder than raw potato cubes, I figured maybe if I added baking soda to the cooking water, the baking soda would act like a tenderizer, softening the bean quicker. Well it worked. So this is what I do. 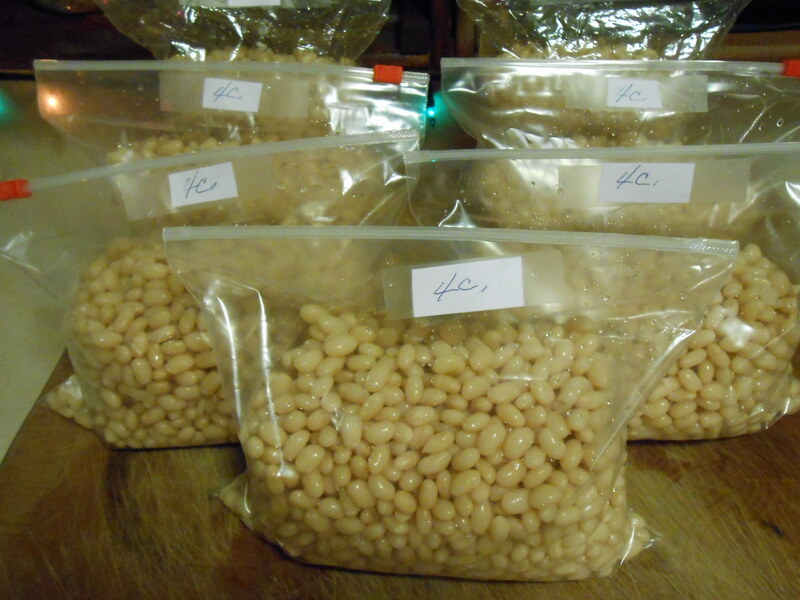 First presoak the beans: Rinse the dried beans thoroughly, then combine 4 cups beans with 12 cups water in large pot. Bring to boil, cover tightly, turn heat off and let set at room temperature overnight (or 12 hours). The next day, drain the beans in a colander and rinse thoroughly, drain again, then pack in measured amounts into plastic bags or covered containers. Label the containers with the amounts and freeze till you’re ready to use them. Although the presoaking takes a long time, the actual labor time is minimal. 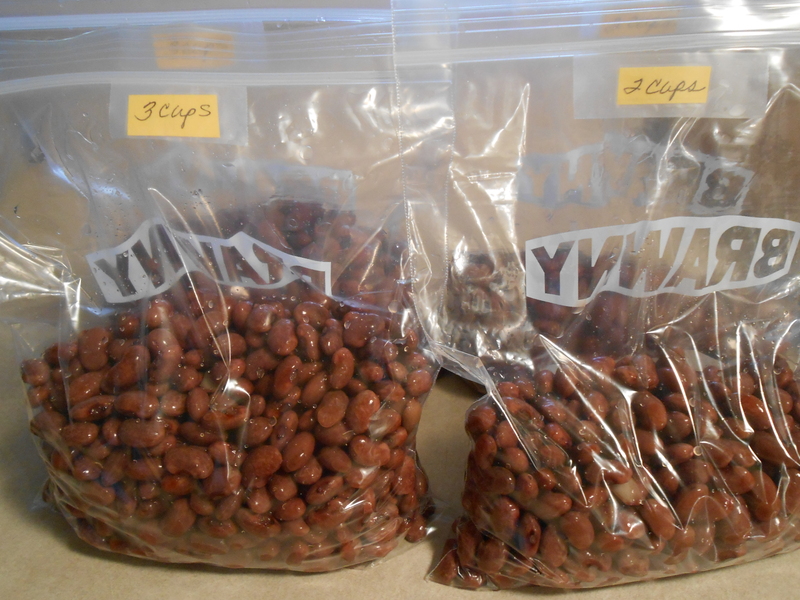 Cooking the beans: Say you take 2 cups frozen presoaked beans out of the freezer. Combine the beans with 4 – 5 cups water and 1 t. baking soda in a saucepan.The baking soda doesn’t add much salty flavor – barely noticeable. Bring to a soft boil and cook till tender. Now comes the tricky part. It doesn’t take long, so as they cook, keep tasting a single bean for texture. You’ll notice how they’re progressing in the softening process. Well, there’s a point whereby the beans will go from moderately firm to too soft, so you have to be right there at the stove. The first time I did the red beans, I returned to the computer for a few minutes, thinking they would take longer than they did, and when I returned to the stove, they had become soft enough to use as refried beans – which I did do. It only took 20 minutes for the red beans to achieve a texture that was too soft. The navy beans soften up even quicker; 5 minutes at a soft boil and you need to be ready to drain them immediately. Then add them to whatever recipe you’re making. By the way, after draining what were now refried red beans that didn’t need to be fried, I added a little extra virgin olive oil, 1/2 t. salt, garlic to taste, a little freshly ground black pepper and thoroughly enjoyed my mistake. The key factor to remember is that the beans go from moderately firm to very soft in an instant. These beans will not all retain their perfect shape like the canned beans do, but they’re creamy throughout and don’t take long to reach that texture achievement. And they’re cheaper. And I save on electricity. And I can freeze a bunch of them in measured amounts to use when I want to. Save the bean water for another use. If you’re making a soup with the beans, make the soup and cook till almost done, then add the frozen beans along with 1 t. baking soda to the soup. Stir till all foam dissolves, then continue to cook the soup till beans are tender. I just bought a 5 pound bag of pinto beans. They’re up next. Every now and then I want a simple, tasty soup. Beans, veggies, a little pasta, salt and pepper! Combine beans, water, baking soda. Bring to boil. Add vegetables, salt, and pepper as desired. Stir well. Return to boil and add dried spaghetti pieces. Cook till tender. Adjust for salt and pepper and serve. Enjoy the simplicity. Notes: The cooked beans won’t be perfectly formed, individual beans – some of them will break down, which actually imparts more bean flavor to the bean broth.